My hat's off to those 30 or 40 of you who were left at the DBAP early Wednesday morning! Tough guys! Jose Lobaton hit a grand slam and a double this afternoon, and that worries me. That worries me because Kelly Shoppach, one of the Rays’ catchers, is having a terrible year at the plate (.159/.206/.424). Now he didn’t do a whole lot better last year, but they are paying him something like $3 million, so Lobaton may start looking good sometime soon. Lobaton’s only moment in the sun in the majors was for the Padres back in 2009 (5 games, including one inning at second base!). But he’s on the 40-man and he’s certainly making a statement this year (.338/.419/.541, 10 RBI, 21 games). Of course, catchers are different from everyone else and are evaluated on much more than what they do at bat. Jason Hanselman over at DRaysBay has crunched some numbers that imply that Shoppach’s defense is above average. So maybe I don’t have to worry ... yet. Meanwhile, Alex Cobb continues to set a high standard for the rest of the Bulls’ starting staff. R.J. Swindle, who might be in contention for a LOOGY (Left-handed One Out GuY) job down south, was left in after the first out and walked the second guy, who then came home on a home run given up by Ryan Reid. That got the game close in the top of the 8th (5-4), but the Bulls came back to pick up two runs in the bottom of the inning, and Ekstrom, looking much better than he had just a few hours earlier, closed it out. This chart is an idiosyncratic way of looking at team hitting and pitching. 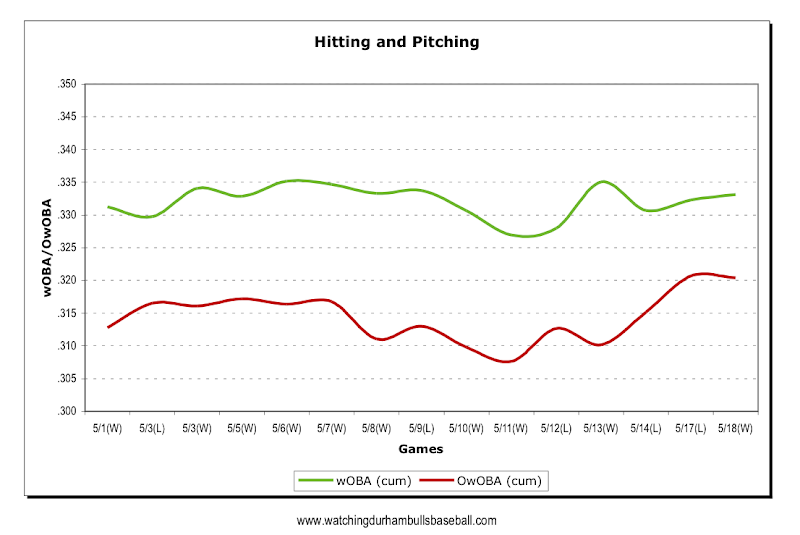 It shows the cumulative wOBA for the entire team over the last 15 games (in green) and calls that “Hitting”. 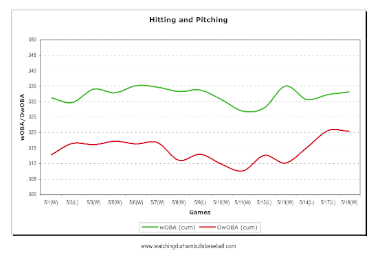 The red line is the wOBA of the Bulls’ opponents (or OwOBA) and that’s called “pitching”. Seems like a reasonable assertion to me. What these numbers show is that while hitting has been OK, aggregate pitching performance has been off the last few games.